Test drive the most trusted directory template to easily manage members, process recurring payments, publish content & so much more! - Try a Free Demo Today! The perfect online directory template for any type of website, from a business search directory to a local events directory. Allow paying members to post business listings, events, products & so much more. 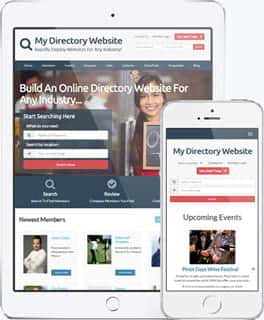 Over 10,000 directory website owners, groups and organizations around the world trust our business directory template to power their online communities and directory websites. I first tried using WordPress themes but the plugins I needed to run my directory website kept breaking. 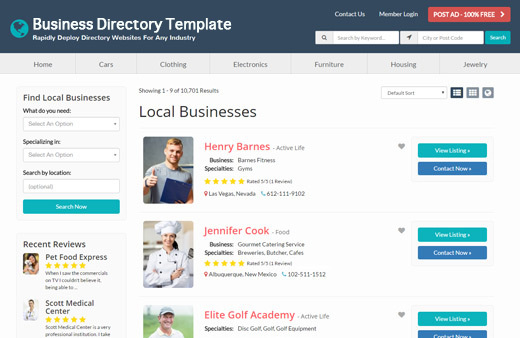 Brilliant Directories is a truly hassle-free business directory template. The free demo was a perfect way to test my idea before spending a dollar. So happy I found this business directory template. I totally love it. Thank you guys so much! I've been with Brilliant Directories for over 2 years. This business directory template absolutely rocks! I run multiple sites with it and plan to launch more very soon.